Mazda MX-5 - first impressions | What Car? 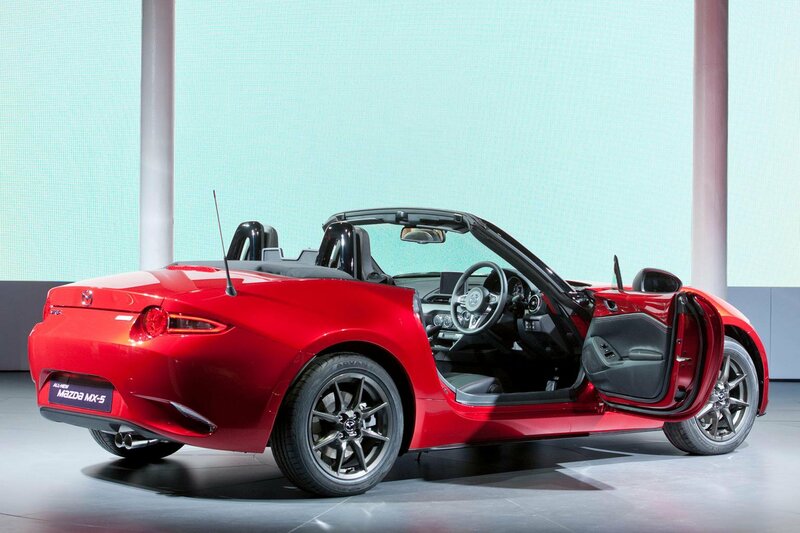 Very few details of the new Mazda MX-5’s spec or trim options have been revealed at the car’s official launch, with the car maker preferring to keep them under wraps until closer to the car going on sale around the August 2015. What’s clear is that, although the car on display at the launch is likely to be a high-spec model, the interior quality has been raised considerably. The materials are markedly more plush, the detailing more refined and the infotainment system – as seen on the latest Mazda 3 – both modern and functional to use. The cabin remains snug for even moderately sized occupants, but the signs are that drivers will be delighted with the layout. The right-hand-drive model displayed, and which What Car? has sat in, is notable for the ‘wraparound’ feel of the cabin and the neat, uncluttered dash layout. The clutch and brake pedal are just so – the brake pedal in particular set dead centre of the driving position – while the accelerator is fractionally set right, presumably to help larger drivers avoid brushing the steering wheel. The rev-counter is placed centrally on the dash, and enlarged to be directly in the driver’s eyeline. In part, this is a trick to emphasise the MX-5’s sporting credentials, but it also has practical benefits – on a twisty country road it will be possible for the driver to know when to change gear and whether they are in the optimum rev band with only a glance from the road. The switchgear is large and simple to locate. In the centre console, below the digital display screen mounted above the dash, are easy-to-locate controllers for the temperature, fan speed and direction. Two cupholders sit above the central cavity between the driver and passenger, while below there is a storage area. As now, there is more storage in the centre of the car behind the driver and passenger’s shoulders. Meanwhile, the swooping bodyline and sharply raked, set-back windscreen are also likely to pay dividends for the occupants. While the cloth roof inevitably makes the tight confines feel especially constrained when in it’s up, visibility and openness feel unusually high even for a roadster when it’s down. Likewise, the bodywork is left exposed around the edges of the doors by shrunken trim panels. It is a similar trick to the one used by the VW Up, and although it is hard-edged to the touch, it adds lustre to the interior looks, as well as helping unify the exterior and interior designs. Ultimately, the overwhelming impression is that the Mazda MX-5’s design has been moulded to enhance the sensations of driving for its occupants. Such one-tracked focus is rare in car design these days, given the multitude of demands owners make of their cars, but on this occasion the MX-5’s creators appear to have been given a singular brief. We expect to find out if it drives as well as it looks around spring 2015.